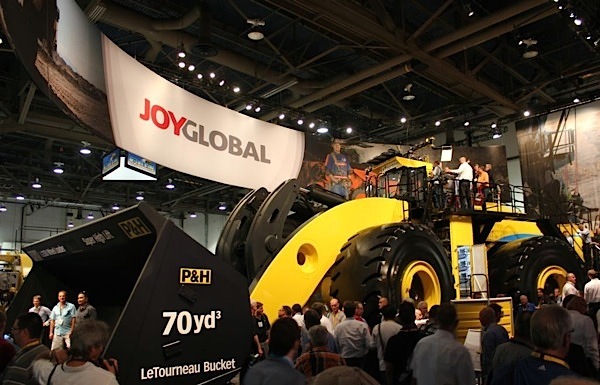 U.S. maker of mining equipment Joy Global (NYSE:JOY) logged Wednesday an unexpected and sharp loss in its fourth quarter and announced it was cutting its dividend as it struggles to survive long-dragged drop in demand triggered mostly by low commodity prices. Announcing a loss of $1.32 billion for the fiscal fourth quarter ended Oct. 30, the Milwaukee-based maker of giant shovels, conveyor belts and jumbo drills also posted guidance for the current fiscal year well below analyst expectations. Joy now expects sales of $2.4 billion to $2.6 billion for the current year, down from $3.17 billion in the year ended Oct. 30. That means the mining equipment maker expects to sell less than half the $5.66 billion peak it reached only three years ago, around the time mining companies began cutting spending on new equipment and servicing of old machinery. The company took impairment charges of $1.34 billion during the quarter, citing a “prolonged severe downturn of global commodity markets.” The write down compares with profit of $129.7 million, or $1.31 per share, barely a year earlier. Joy Global said it had exceeded cost-reduction targets during the year and aims to cut another $85 million in 2016. "We are controlling the things we can, and are confident our strategies and operational execution will position us well for the future, but the state of our end markets sets up another challenging year in 2016," Chief Executive Ted Doheny said in a statement. The company, which gets more than 60% of its revenue from coal miners, forecast adjusted earnings of 10 cents to 50 cents a share for the current year, down from $1.95 per share in the year ended in October.